This post is part of my course on game theory. For an index, see here. 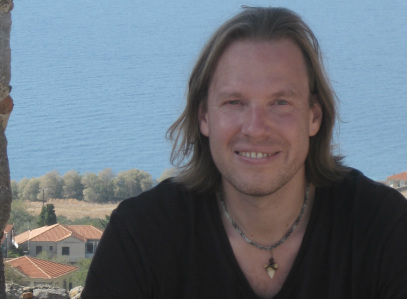 The course follows the lectures by Ben Polak which are available on the Open Yale Courses website. 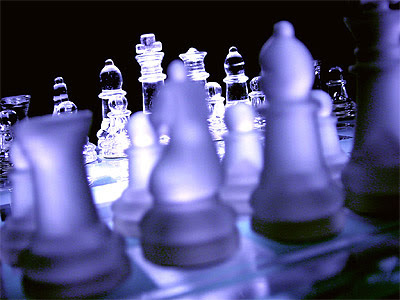 In the previous post we discussed the iterated deletion of dominated strategies and the concept of common knowledge. In this post, we will continue to explore these two issues by looking at an easy, but famous theorem from political science: the Median Voter Theorem. There are two candidates running for president. Each candidate must position themselves along the ideological left-right axis in order to appeal to voters. Suppose there are ten possible ideological locations along this axis. Suppose further that voters are evenly distributed along this axis, i.e. approx. 10% of the pool of voters are located at each of the ten ideological positions. See the following diagram. This election can be modelled as a game. 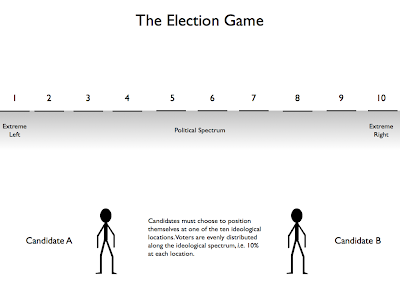 The candidates are the players; the strategies are the positions they can choose along the ideological spectrum; and the payoffs are the percentages of the vote they manage to capture. Obviously the goal of each player is to maximise their share of the vote. To help them decide what their strategy should be we need first to introduce a couple of rules about the voting patterns of the electorate. Suppose that voters always prefer the candidate that is closest to their own ideological position. This means that an extreme right wing voter will vote for a left wing candidate provided that candidate is less left wing than their rival. In addition, suppose that if the two candidates are an equal distance from the voter’s preferred position, the vote will be split evenly between the two candidates. In other words, one candidate will get 5% of the available 10%, and the other candidate will get the remaining 5%. For some reason, as I write this down, it sounds very complicated. But it’s really not. Now that we have the set up for the game, we can proceed to solve it for both candidates. To do this, we will once again make use of the iterated deletion of dominated strategies. Remember, this involves putting yourself (if you are a player) in the shoes of your opponent and thinking about how they would respond to your choices. Let’s start with candidate A and see what would happen to him if he decided to position himself at location number 1 (i.e. he chooses the extreme left wing position). We could continue on through all ten locations, but its pretty clear by now that no matter what B does, A is always better off playing location 2 instead of location 1. Thus, 1 can be considered a dominated strategy. Since 1 is dominated, we should eliminate it from the pool of viable strategies. What happens then? Location 2 becomes dominated by location 3. In other words, A will find that it’s always better to choose location 3, irrespective of what his opponent does. Thus, 2 should also be removed from the pool of viable choices. I leave the proof of this to the reader. It is important to note that 3 only becomes a dominant strategy after 1 has been removed from the pool of viable strategies. The reasoning that underlies the deletion of 1 and 2 works from the opposite side as well, i.e. for locations 10 and 9. What’s more, the reasoning works until all strategies apart from 5 and 6 are eliminated for both candidates. 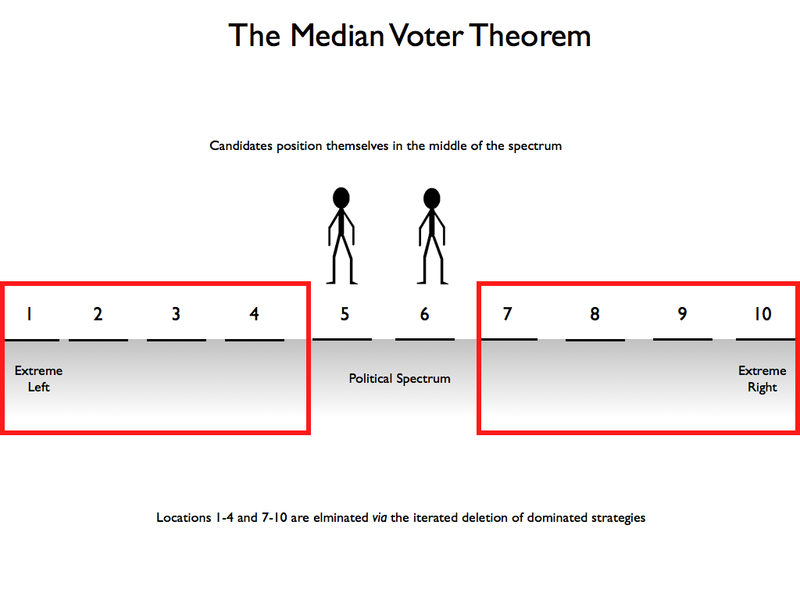 This is the prediction of the median voter theorem: both candidates end up positioning themselves in the middle of the ideological spectrum. Although the Median Voter Theorem is sometimes thought to work well in predicting the behaviour of U.S. presidential candidates, there are certain key weaknesses in the model. First, the model assumes that voting preferences are arrayed along a single dimension. It could be argued in response that political preferences are in fact multidimensional. Strangely, although I think political preferences should be multidimensional, I find, in practice, there is much to be said for the idea that people align themselves along a simple, single left-right dimension. Second, the model assumes that preferences are equally distributed along the spectrum when in reality they might be skewed towards one end or the other. Actually, it turns out that this isn’t that big of a problem. It just means that candidates will/should position themselves in the middle of whatever the actual distribution is. 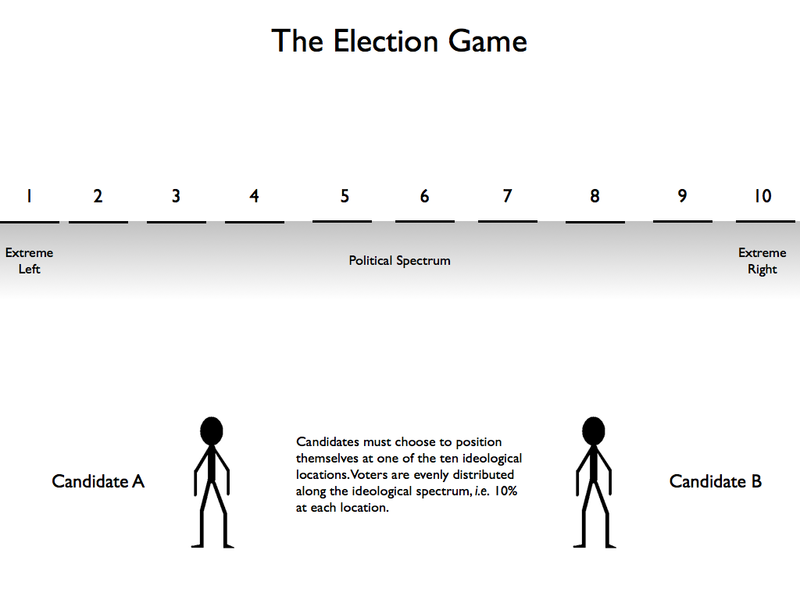 Third, the model assumes that candidates can simply pick the ideological position that suits their needs. In reality, candidates come with histories (voting records, policy statements etc.) that might make it difficult for such positioning to be credible to the electorate. Finally, the model assumes that every voter actually votes. If not-voting is an option, things become more complicated. The model also becomes more complicated when there are more than two candidates running for election.